Since garlic was one of the few things we managed to grow successfully in this summer of failures, I decided we should plant more than last year. It can be tough for little hands to get the head started in separation, but if you get them started, they can separate them. I followed the lead of our CSA, Restoration Farm. Since they planted last Saturday (and we went to help for a little while, which refreshed our memories on how to plant) and Caroline said she follows biodynamic practices for most auspicious sowing moments, we planted a day or two later, which was about as soon as I could manage. note that the bottom end is free of the root residue, but not cut off. Leave it intact! We used the tomato bed, since it is a good idea to rotate vegetables every year. If any pests or blights have made a home in the bed, when spring comes they won’t find their usual victims waiting to be destroyed. Instead, they’ll find something else that they don’t like very much and can’t harm. We’ll put the tomatoes where the peas were and where there should be a whole lot of nitrogen that they left behind. The bed is about 10′ by 3′. Farmer Dan suggested we plant the garlic every 9 inches in rows 1 foot apart, which meant we could stretch a measuring tape across and Leandro could learn a lot about the 9 times tables. 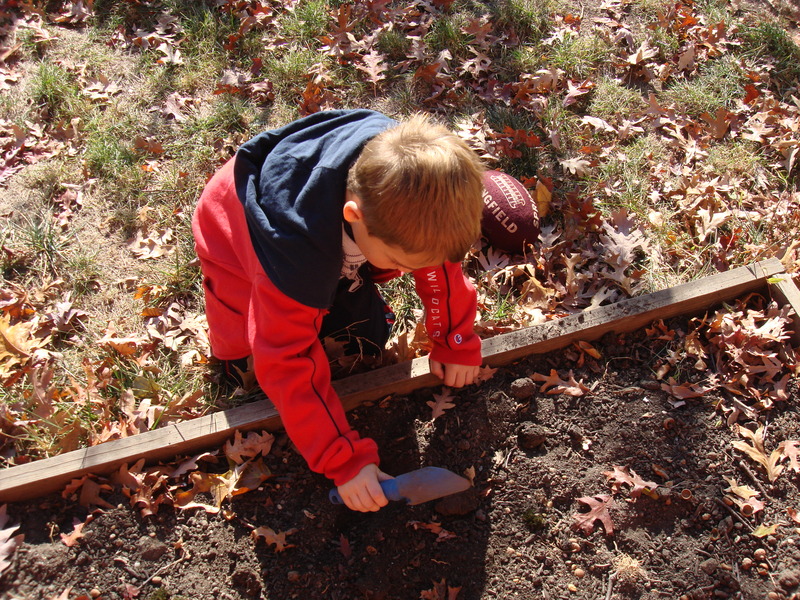 So we turned the dirt, outlined three rows and made holes every nine inches (How many cloves do you think we planted?). We separated the heads into cloves, being careful to leave the cloves tightly wrapped in their papery husks so they don’t rot before they have a chance to overwinter and start sprouting in the spring. You stick them in, root end down and pointy bit up, cover and, if necessary, water. Then you play football in the backyard until the sun gets too far down in the sky and it gets cold. And the answer to how many is: 30 cloves, each of which we hope will result in a new delicious head of 4 to 10 cloves next summer. And in the meantime, we can just forget them! Good math = great eating, apparently!!! 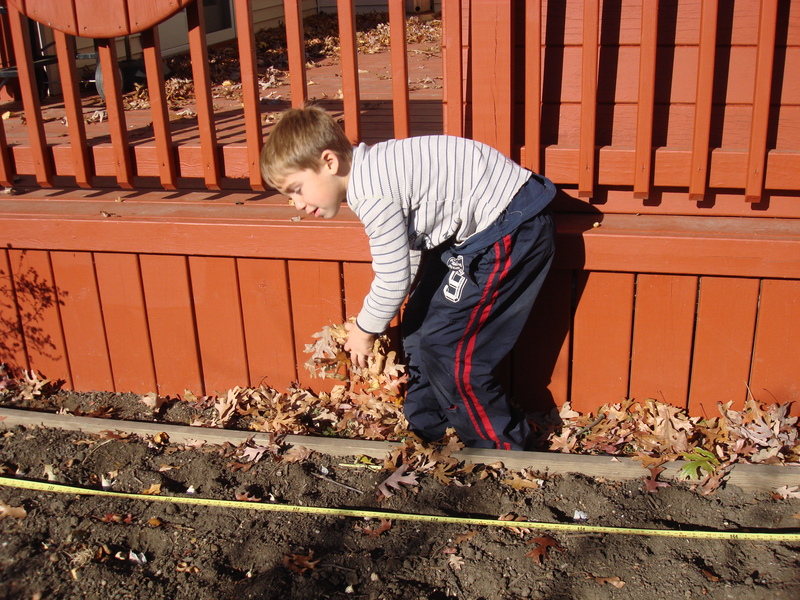 That’s great getting the kids out in the garden and getting a math lesson in at the same time. 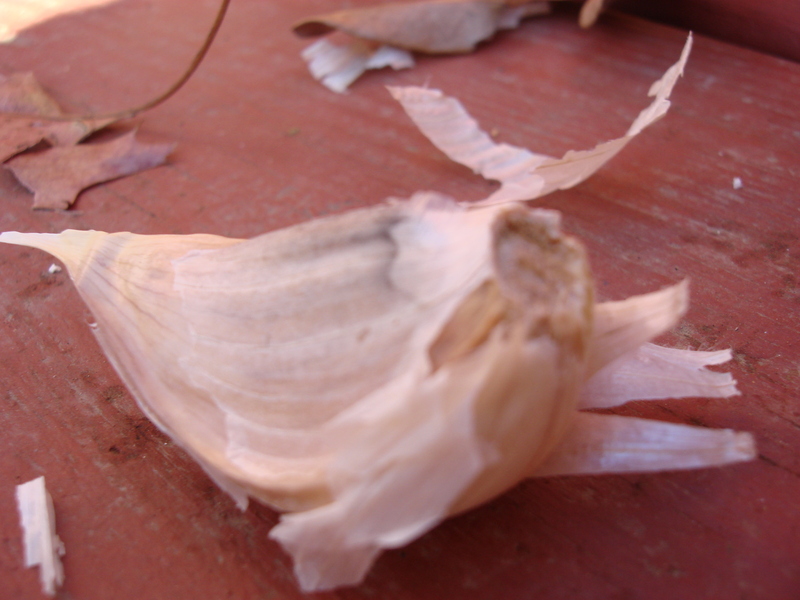 I’ve been growing my own garlic for a few years. Last year I used rows on the side of my garden. This year I planted along the edge of my garden with the dirt mounded up against the stone I use for edging. I’m thinking this is a more efficient use of space. In the spring, I’ll plant my tomato plants about a foot behind the garlic. It’s an experiment every year! I don’t think anyone had a good gardening year. It was tough this year to know what to do with the weather…especially for a beginner like myself! The tomatoes were really successful though. A pity that I got an infestation on the sees I was saving from the best of the lot…. I don’t think anything was particularly successful for me this year. As soon as I planted we had cool weather for a few weeks, then wet for a few weeks then dry, then hot. I couln’t get anything to thrive. Gardening is like running that way, you plan things out, adjust for the uncontrolables and then make plans for next time. 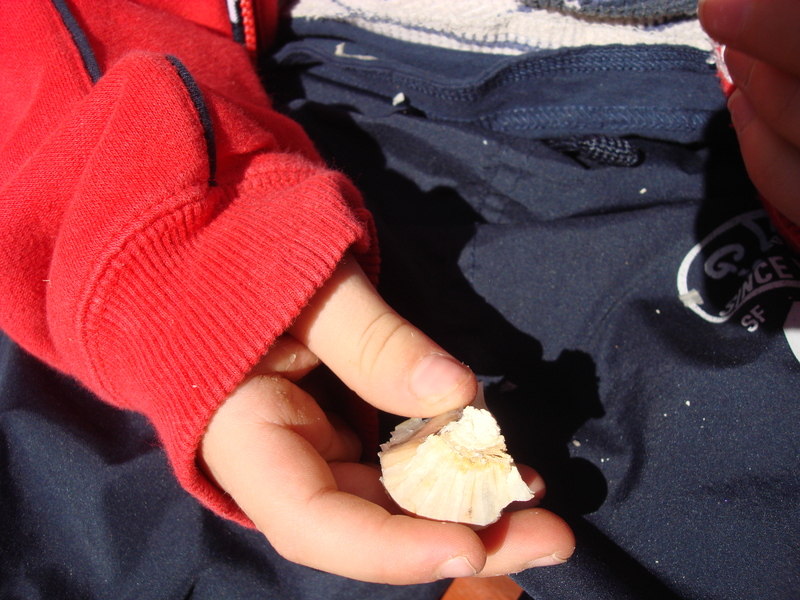 I can’t wait to see the garlic next year. And what a bonus that Leandro is learning the times tables also. Amazing! An inspired moment from a decidedly nonmathematical person…I will be learning the times tables along with him, as I never learned them in school for some reason! Yes, always a nail biting moment for me. I am quite good at estimating relative costs in a supermarket though…10 oz. of x being not a good deal compared to 16 oz of the other….